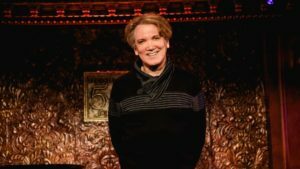 CATSKILL, N.Y. — Playwright, actor, director and cabaret artist Charles Busch chronicles his struggle to find his place in the theater world in New York City in his latest cabaret performance, “Native New Yorker,” at the Bridge Street Theatre on Sunday, Jan. 27. “It’s really about my life in the 1970s,” Busch said. Busch said this performance is a follow-up to a show about his childhood and adolescence in the 1960s he did previously with his musical director, arranger and pianist Todd Tom Judson, who lives in Catskill. So it only felt natural to continue the story into the 1970s, he added. Busch said Sunday’s show finishes with the opening night of his first big break, “Vampire Lesbians of Sodom” off Broadway. “It was a surprise hit,” he said. Busch also said they originally envisioned this production as a “wacky play” they’d do for perhaps one weekend at an art gallery in Manhattan’s Lower East Said. It moved to the Provincetown Playhouse and ended up running five years, according to Busch. During this journey, he added, he discovered what he did best, which was writing his own material and creating a career that wasn’t like anyone else’s. But he had to take a bunch of odd jobs before he got there. Busch described this part of his life as a long rocky road. “I was a receptionist in a zipper factory. I sold hot typewriter ribbons on the telephone,” Busch said. He said he later capitalized on his drawing skills by working as a quick sketch portrait artists. He worked for an agency Rent a Witch, which usually traded in booking tarot card readers, among other things. “But they sent me out to weddings, bar mitzvahs to draw psychic portraits, which meant that I drew you as you were in your previous life,” Busch said. Busch said he plans to tell this story through a mix of storytelling and a mix of songs from 1970s theater, film and pop music. These included 1970s hits like “Touch Me in the Morning,” the disco song “Native New Yorker” and Jim Croce’s hit “I Got a Name,” along with Broadway favorites from theater legends Stephen Sondheim and Rubert Holmes. Busch said he never changes the lyrics of a song, but he gives it a treatment that makes it more “theatrical and dramatic.” He also said he’s taken a real liking to cabaret in the several years he’s staged it in 25 different cities across four continents. Instead of playing a role, he added, he seeks to be a heightened version of himself. Busch said this show will serve as a bit of a preview for a new program he’s opening in February at Feinstein’s 54 Below, a nightspot at 254 W. 54th St. in Manhattan. Busch added that he prefers to test out shows outside of New York City, and Catskill fits the bill. “It’s too terrifying to open a show cold in New York you’ve never done before,” he said. Busch also said he’s worked on new songs over the course of the last four months and he inserts them in his old shows one at a time. Busch said he prefers to base his plays, 99 percent of which are comedies, on his love for classic film. “I grew up loving old movies on television,” he said. And that filtered into his work. He added that, these days, he finds it refreshing to be himself in a cabaret act instead of playing a character. He shared his thoughts on writing. But, even as Busch has realized his dream, he’s never been able to stop looking for work entirely. When you finish a play or movie you’re out of work, and then you’re thrown into a new situation with a new work family, he said. “Fortunately for me, I was a writer,” Busch said. “I’ve always generated my own work.